When the project started, we invested the time in creating something small but efficiently working, so we didn’t really stop to think about creating a brand product. Our design needed a little love and we knew it was a debt that we would pay in the future… Now, thanks to Silvia Calavera we have a better branding design and the website was according to it. 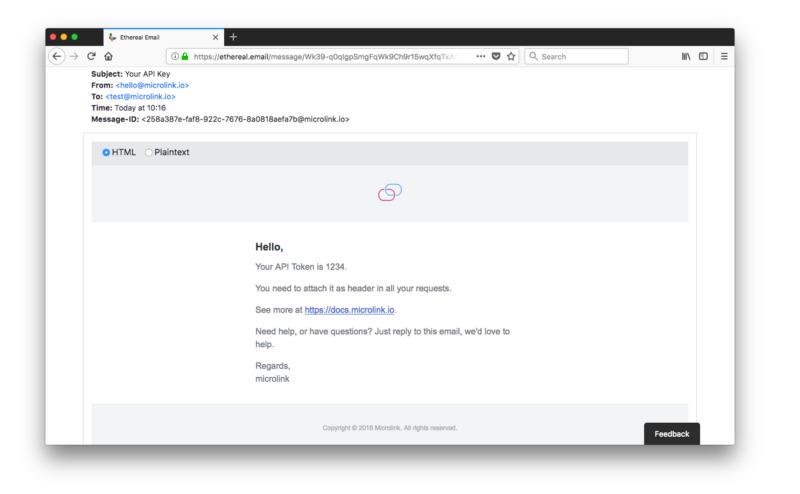 In addition, we took this opportunity to improve our payment process, you’ll now receive your API credentials immediately after payment. Meet tom.js.org, a microservice for managing payment process. The only place for checking all the documentation is docs.microlink.io. As we announced on newsletter #1, we started shipping a set of front end libraries to make consuming the microlink API as easy as possible. We also want to provide examples, and ways to integrate it with popular frameworks, like WordPress, Jekyll, etc. Maintaining documentation is laborious and requires effort. 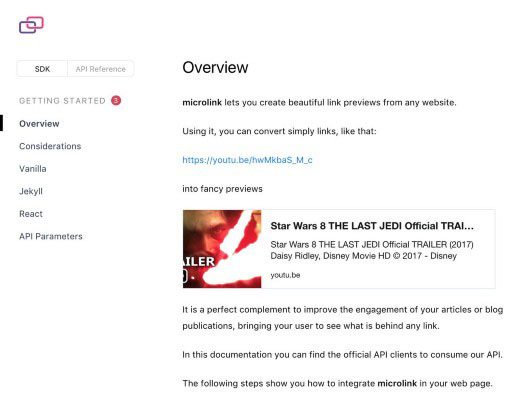 We needed to combine all the documentation associated with microlink.io into one place. After comparing multiple approaches on the matter and seeing how other companies take on the challenge, we decided on ZEIT documentation portal. Although it required some laborious work, the final result is impressive. We are very grateful to ZEIT for making it possible. metascraper is our metadata extractor and we improve it every week. Our current target is improving the data accuracy related with video content. On this period, we did a lot of internal improvements and developed metascraper-youtube for enhancing the results when you want to get information from a YouTube url. Under the hood, we’re testing something pretty exciting: Adding a new video property (spoiler) into the microlink API. It would return any video detected in the target URL. This also allowing us to build a richer content preview (with the Microlink SDK). We seem to be heading in the right direction, stay tuned for our next newsletters to see how it turns out 👀. A new Microlink SDK demo at microlink.io. First of all, we reached 100 stars 🌟 on GitHub! We wanted to be sure the cards responded properly to different viewports, so we put extra effort into improving the responsive aspect of things. We’ve also added a new demo at microlink.io showing a quick look of what you can achieve with the microlink SDK. With the above-mentioned documentation unification we’ve also added more examples and API parameters that you can use to customize your previews.